One of these days, I’m going to actually meet the deadline for the Monthly Stitch posts. I finished this blouse in mid-March, but pictures held me up (and helping my friend with her wedding this past week. Today is couch/recovery/sangria day). Fortunately, I got a fancy new camera that actually takes decent pictures! It’s a Fujifilm FinePix S6800 if you’re curious. Man, flash makes an insane difference. 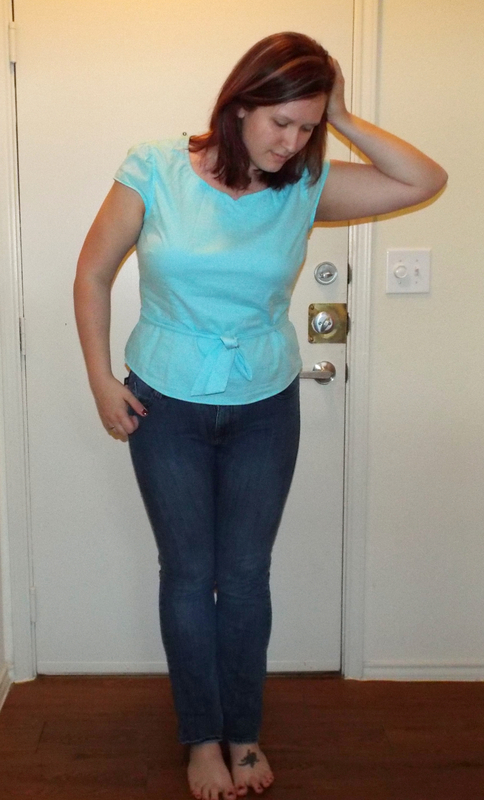 The Alma blouse beat out the Renfrew top for my March challenge by one vote. I decided to make both since tops are something I really need more of in my wardrobe. I was super happy with how quickly this blouse came together. I think it took me somewhere in the realm of 4 hours. 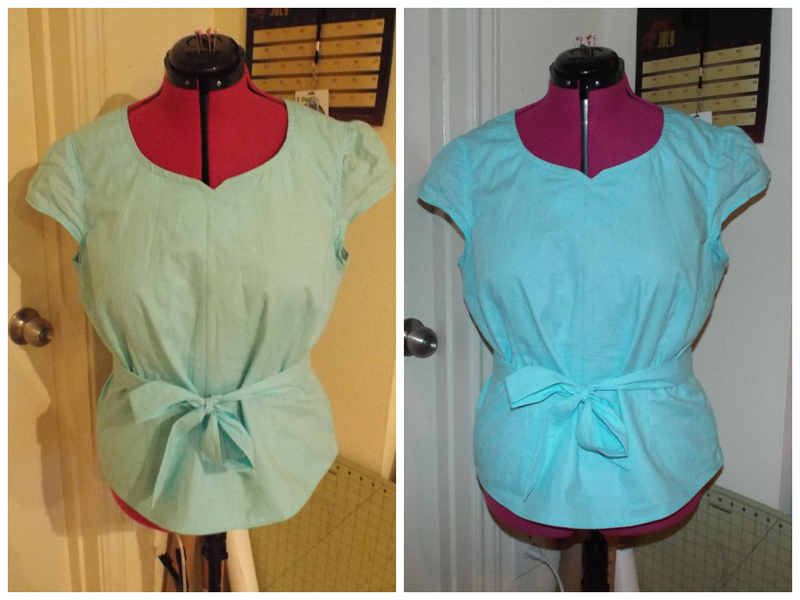 The only things that slowed down the process were the sleeves and the neckline. Checkin’ out my awesome pedi. Fabric: 2 1/2 yds of a cotton voile from Golden D’or. I picked up extra yardage to underline the front. The fabric is marvelously airy (perfect for Texas summers), but wrinkles like a mofo. I have to iron and steam the crap out of it anytime I wear it 😦 I’ll pick something less wrinkle-tastic for my next version. 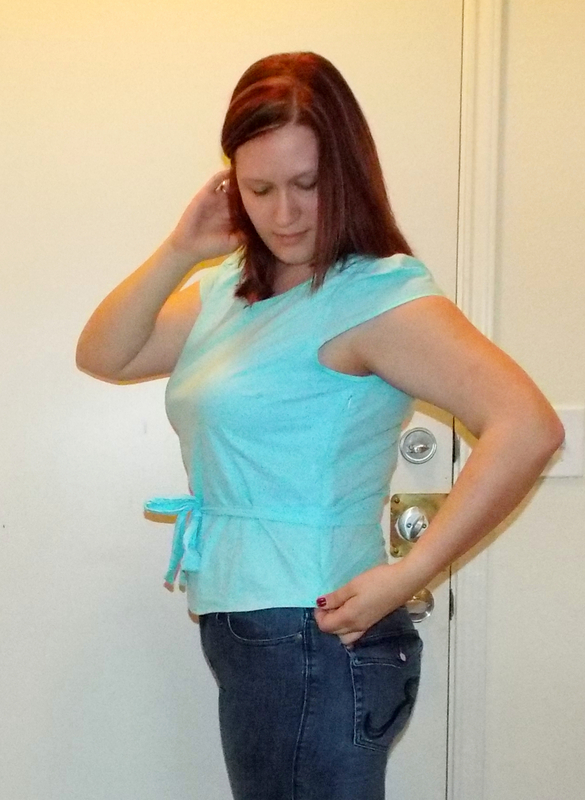 Alterations: Cut a 16 for the bust and waist and tapered to a 14 at the hips. However, I think I could have taken the entire thing in an extra size because I can pull it over my head easily without the zipper. Notions: Thread and invisible zipper. Oh, hey invisible zip. Didn’t see you there. Make it again? : For sure. The main reason I bought this pattern is because it’s the perfect base for my upcoming Pokemon trainer cosplay. But it’s also an amazingly versatile blouse for work and hanging out. Since making it, oh, 2 weeks ago, I’ve worn it to brunch with the girls and to work. It goes well with skirts, trousers, and jeans. Favorite parts: The overall shape. It’s very flattering without being super tight. Other thoughts: This is such an adorable top. I wanted something that looked spring-y, breathed well, and could work for a number of settings. This definitely fits the bill. I do have a few hangups that I’ll probably go back and fix (maybe). The fabric belt is adorable, but when I make future versions, I’m going to add length to accommodate for it. The top hits a good length on me without the belt, so I think I’ll take it in an extra 1/4 in on each side to get a bit more shaping. I also still need to add the thread loops on the side seams. Playing with the self-timer on my camera. Don’t mind me. The gathered cap sleeves are cute, but I don’t think they really work for me. I already have broad shoulders so in future versions I’ll make longer sleeves or go sleeveless. I haven’t decided yet if I want to seam rip these bad boys and make it sleeveless. It’s definitely a possibility, since I’m fairly certain I put one of the sleeves in backwards 0_o. The bands are a very clever finish for this version. The notched neckline of view A is cute, but I think I’ll go with the rounded neckline for speed in future versions. 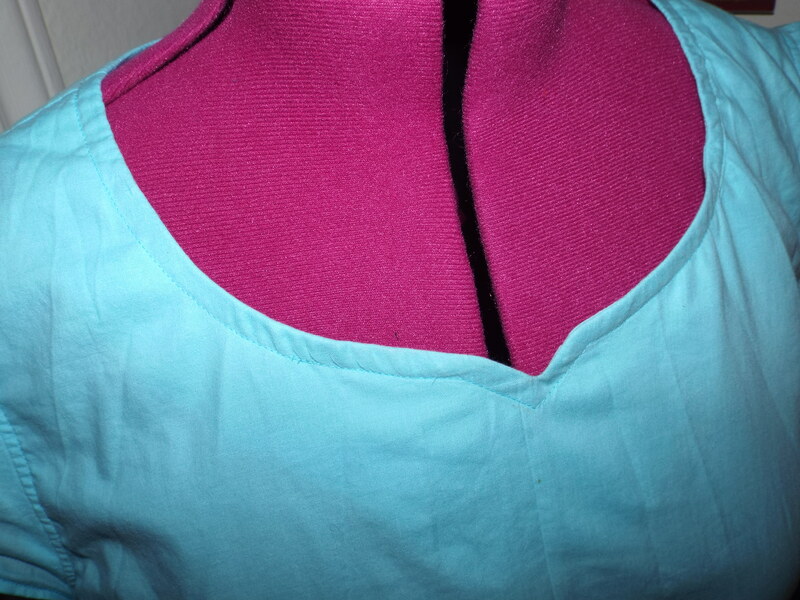 I opted for the notched neckline for visual interest since I chose a solid fabric. I may add an extra row or two of top stitching. We’ll see how I feel about it in a few weeks. All in all, a cute blouse. It’s a great wardrobe staple, though I imagine I’ll wear it more on the weekends due to the wrinkle factor. That drives me crazy at work. On to April’s challenge!